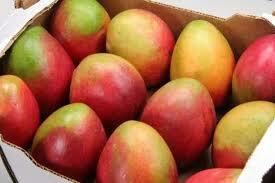 I’m “sweet” on Costa Rican Mangos! They’re everywhere!! 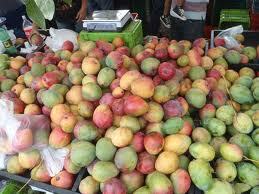 Mangos (or tropical peaches) are among the most widely produced and consumed fruits in the world. Introduced to Costa Rica in 1796, limited exportation started in 1980, but this fruit still remains primary grown for national consumption. 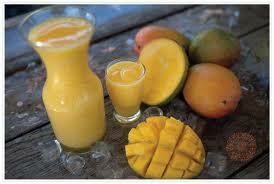 Production estimates put mangoes between 40 and 50% of all the fruit in the world produced for juice, canning and fresh consumption. Originally cultivated on the Indian subcontinent, mangos are now produced along the equatorial band throughout the world, with Mexico currently holding the title as the largest exporter of fruit and Costa Rica boasting of a robust crop that is mostly enjoyed nationally. To be permitted into the USA, fruit must undergo a process called Hot Water Quarantine Treatment to kill any fruit fly larva or mature insects. This is a process where the fruit is submerged in 115°F water for 55 to 110 minutes. This treatment process is ideal for the growing trade in organic mangos as it adds no artificial inputs to the post harvest process. Some countries have opted for irradiation method instead, exposing the fruit to low levels of radiation to eradicate and possibility of existing fruit flies. These fruits will not qualify for the “organic” seal of approval. groups in a typical USA produce department. The smallest group is the green cooking mango, which is used primarily in Southeast Asian recipes, or “Ticos” enjoy these sliced and dipped in salt. There is also a reddish green skinned variety which is generally quite large, as well as bright yellow skinned smaller fruits, the latter two which will start green but change coloring when the fruit is ripe and ready to eat. One popular variety is known as the Hayden. This reddish green skinned variety is plain in appearance externally but extremely flavorfully and less stringy and fibrous than most other varieties, so it is a top international seller. areas, while the green varieties will retain some green, with a purplish coloring indicating it’s level of ripeness. 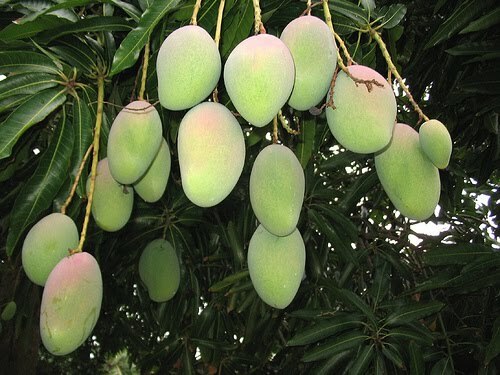 For those that prefer a slightly tart Mango, the color does not need to be uniform from the stem to the flower end of the fruit, even the green coloring can provide a wonderful sweet surprise! The red blush on some varieties is due to direct exposure to sunlight and may not be a factor in the quality or ripeness of the fruit, so one has to learn which varieties suit them best. 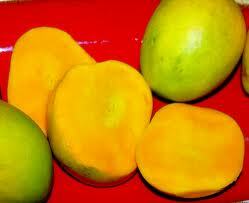 An important sense to engage when picking the perfect mango is the sense of smell. 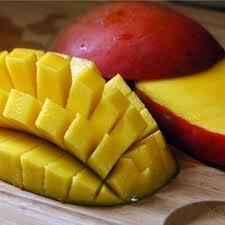 A ripe mango has a full, sweet fragrance easily indicating its readiness for consumption. Keep in mind that most tropical fruits, mangos included, can discolor and lose much of its flavor if refrigerated, so it is recommended to keep them at room temperature. 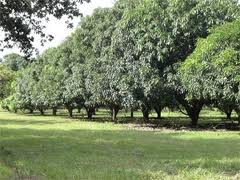 and fast growing and the canopy can be broad and rounded, even providing good overhead coverage in tropical zones inclined to sudden rainstorms. 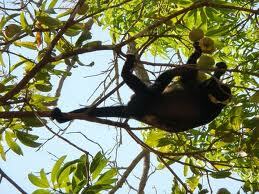 They are considered a large tree, often some 65 ft. across their canopy. The tree is long-lived with some specimens known to be over 300 years old and still fruiting. In deep soil the taproot descends to a depth of 20 ft, and the profuse, wide-spreading feeder roots also send down many anchor roots which penetrate for several feet and make this specimen very sturdy in otherwise normally unstable terrain. 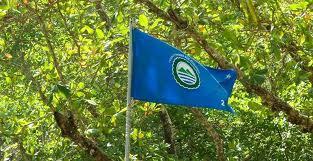 Costa Rica’s Second National Flag…..the Ecological Blue Flag Award!! 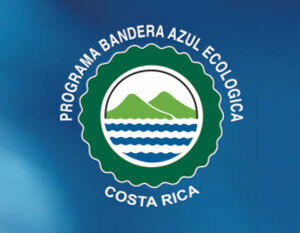 Mother Nature had a hand in making Costa Rica’s beaches beautiful, but the local government of Costa Rica continues to encourage businesses and citizens to help these same beaches remain clean and beautiful thanks to the Bandera Azul Ecologica (Blue Ecologic Flag) program. Created in 1996 with the goal of preventing, stopping and cleaning up the pollution that threatened the health of both people and the environment, great strides have been made to safeguard the public and diverse ecologies of Costa Rica. Over the last 16 years important measures have been taken to certify more beaches nationwide, surely making Mother Nature proud and enabling the continued promotion of Costa Rica as a World Class eco-tourism destination. 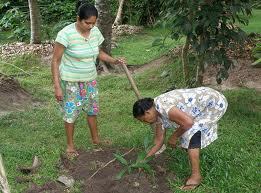 The Blue Flag Ecology Program functions as a multi-agency venture of numerous Costa Rican government institutions. Some of these include the Costa Rican Tourism Institute (ICT), Ministry of Environment (MINAE), Insituto Costarricense de Alcantarillas y Acueductos (AyA), Ministry of Public Health (MINSA) and National Tourism Chamber (CANATUR), along with the members of local communities who personally strive and sacrifice to achieve the Blue Flag certification. Under the administration of the National Blue Flag Commission, these organizations have achieved certification on an ever growing list of beaches, schools and businesses receiving this prestigious award. sanitary facilities, signage, tourist safety, environmental education and the involvement of the community regarding beach maintenance. The PBAE evaluated each beach based on 7 different aspects: quality of seawater (35%), quality of water for human consumption (15%), sanitary quality of the coast, which included garbage (10%), domestic sewage (15%), industrial sewage (5%), environmental education (10%), and safety and administration (10%). Only beaches with a 90% score can receive the coveted Blue Flag award. Based on the performance across these seven dimensions, each beach is then given a grade of 1 to 5 stars. Out of the some 126 beaches that competed for the award, of the eighty winning beaches, only two of them got a top of the line 5 star grade. 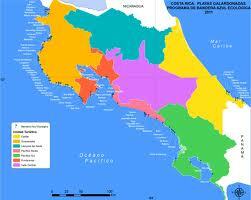 These were Punta Madero and Blanca, located in Guanacaste and Puntarenas respectively. beaches awarded the Blue Flag are then monitored on a monthly basis to make sure they continue to meet the strict guidelines throughout the year. Although the Blue Flag Ecology Program was founded with the idea of improving education and awareness regarding the environment, the program has grown to provide a great sense of pride and accomplishment for not only the countries beaches, but local businesses, schools and other tourism operations. Every year more and more beach communities (and businesses) compete for the Blue Flag designation, furthering the original goal to include non-coastal communities, as well as non-tourism projects. A total of 80 beaches from all over the country received the ecological blue flag award this year during the 16th ceremony of the Ecological Blue Flag Program (PBAE), which took place last March 28th at the Double Tree Hotel in Puntarenas. ceremony for the beach category, as a way to honor the hard work of the winning committees. In the past, the ceremony was held at the Presidential House, as part of a community event, so this added recognition was greatly appreciated by the beach comittees involved. 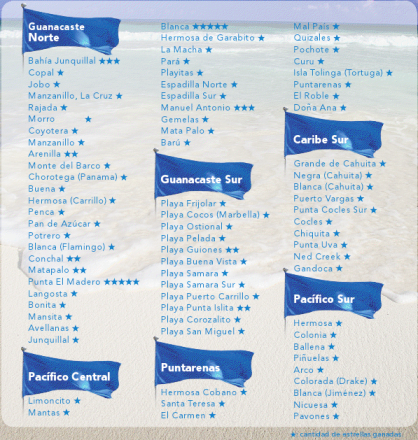 Today Ecological Blue Flags fly proudly over these Costa Rican beaches scattered throughout the country. Environmentally conscious tourists can now make an educated choice to spend their vacation dollars in locations that take pride in offering a healthy and environmentally friendly ambiance to their visitors. So, hats off to our government agencies and their hard work and take a bow all you beaches, schools and businesses that through your hard work and perserverance have achieved this undeniably pretigious Ecological Blue Flag award. Felicidades!! Two stars (AA): If it gets a score of 100% and also has: warning signals for national and international tourists, surveillance and first aid services during weekends and high seasons. Three stars (AAA): If it meets the requirements for two stars, and also has: public showers and bathrooms, touristic information center, comfortable and safe access for people with disabilities. Four stars (AAAA): If it meets the requirements for three stars, and also has: recycling and solid waste separation programs, cleaning actions to prevent vector-borne diseases, permanent surveillance and first aid services, and Local Emergency Committee, as well as participation in AyA’s Sanitary Quality Stamp. Five stars (AAAAA): If it meets the requirement for three starts, and also has: designated parking for people with disabilities, ramps or synthetic rugs to access the beach, Tourist Police services, and participation AyA’s Sanitary Quality Stamp program.